Lest anyone think that designing socks is not a worthy profession, Cookie attended the prestigious Math and Science Academy in Illinois, and applies her math skills to the design of all of her socks. She, like many knitwear designers today, has parlayed this into an exciting profession that involves teaching and lecturing all over the world. It really is a great time to be involved with teaching knitting, as there are retreats and seminars everywhere that one can attend. But I digress, back to the book. The book is broken into 3 chapters: Columns, Tessellations and Diagonals. The Columns chapter is just what it suggests, vertical columns of cables, twisted stitches, lace patterns that are repeated over and over and separated by plain or ribbed knitting. Some of these are simple, such as the BFF which is composed of cable columns, something that I think every knitter has improvised on their own. My favorite in this section is the Marilinda. I love how the pattern continues onto the heel, and is more intricate that the aforementioned. The Tessellations are “arrangements of shapes on a surface leaving no gaps between them”, these patterns cover a wide range of all-over pattern either horizontally or vertically. The Monkey pattern, which was the launch of Cookie’s career is included in this section, but also available for free from Knitty. I have made that sock at least 3 times, and always given it away. I need to make a pair for myself, it works very well with yarn that has a high degree of variation in the colors, always beautiful to look at and knit with, but often hard to find an appropriate pattern for). In this section, my favorite is the Rhombus. These really have the feel of a Tessellation to me, they will need to be knit with a solid yarn that shows off the pattern. The third chapter is Diagonals, and as the title suggests, ribbing and patterns work their way across the socks using traveling stitches paired with lacework or cables. Two of the patterns in the first installment of the sock club used this technique. You just need to keep in mind that the traveling stitches bind the yarn more, and are less stretchy. Some people had issues with being able to get them on their feet. I used Malabrigo sock yarn with mine, and it was not a problem. My top pick in this section is Pointelle. I am in the newly formed CookieA sock club (2 sock patterns and a cookie recipe every other month). I had seen this book around, and decided that it really was time to purchase it. Cookie was coming to the Windy City Knitting Guild to teach a weekend seminar, I had signed up for that, but it is cancelled for the time being. I am not sure how quickly I will get to any of these socks, as I have 4 patterns and 2 yarns coming every other month from the sock clubs. But, if I have some spare time, I know just where to look. It’s a marvellous book isn’t it! I’ve got a gorgeous pair of Monkeys and i’m currently knitting a right foot Pointelle. Cookie A is so talented! 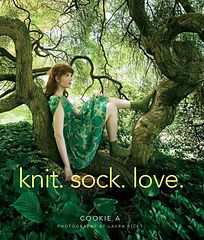 I hope you get to knit some of the socks from this book soon, and that you enjoy them as much as I do!